The owner of Creative Nutrition Solutions, Molly Morgan, RD, CDN, CSSD is excited to announce her newest project: Fuel2Win! Molly is combining her years of experience in working with pro athlete in the Ottawa Senators organization and collegiate athletes with the Binghamton University Division 1 Men's Basketball team into this new resource. 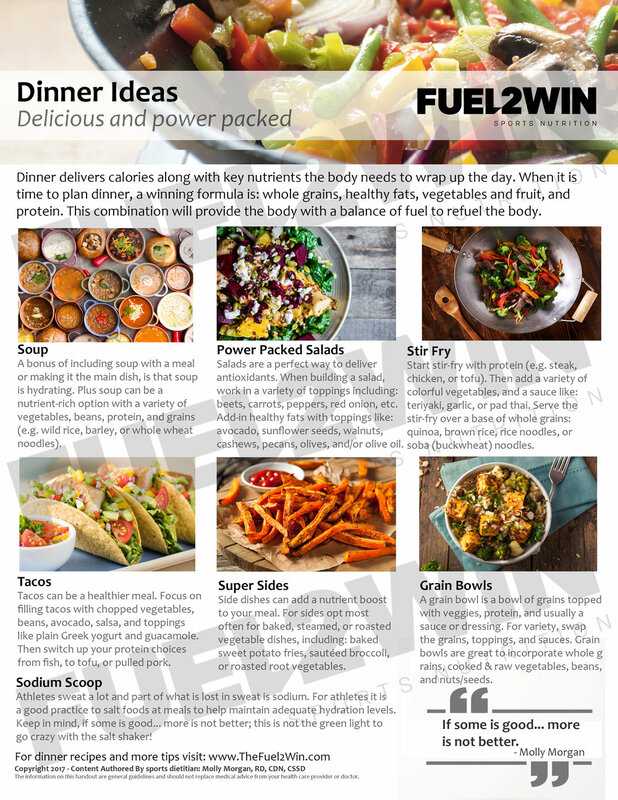 The focus of Fuel2Win is to deliver evidence-based sports nutrition information and resources to parents, athletes, and coaches; including: handouts, recipes, recipes, Q & A's with pro athletes, product recommendations, and more! One feature of the site is great handouts that are loaded with great ideas and practical sports nutrition tips. Pictured here is a sample of one of the many handouts that is available on the site. With the project launch the handouts are free, visit the Fuel2win handout shop to download PDF's of these handouts today. Visit: www.Fuel2Win.com for more details!